According to this legend, Minos’s wife, Queen Pasiphae, who came from the city of Athens, slept with a bull (there’s a lot of bull in this tale) who was sent to her by Zeus, the top God of ancient Greek mythology. After this, Minos’ son went to Athens to take part in the Panathenaic Games (something like the Olympics) and was killed by the very bull that had impregnated Minos’ wife. 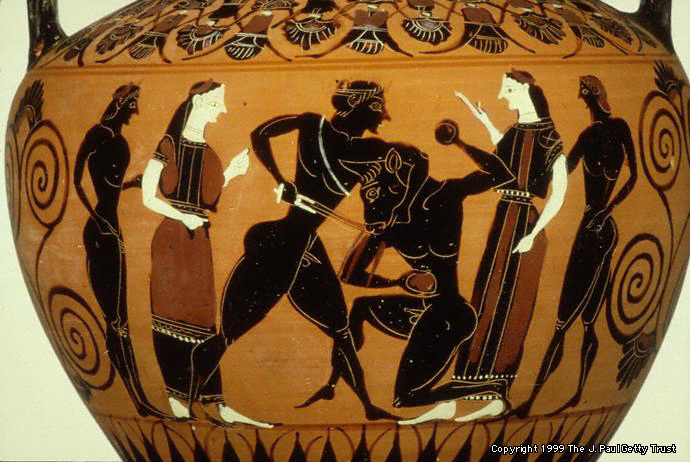 Understandably pretty angry, but mindful that Zeus was not a god to be trifled with, Minos captured the Minotaur (his stepson) but didn’t have it killed. Instead he placed the bull-man in the labyrinth. From Athens, Minos every year demanded seven young men and women from that city as a punishment, and also to avoid a plague (great excuse) and confined them to the labyrinth, where the Minotaur found them and ate them. Pretty gruesome story, but that’s the type the ancient Greeks loved to tell to their children. Anyway, long story short, Theseus in the third year decided to take on the Minotaur by offering himself up. After entering the cave, and using dental floss given to him by Ariadne, daughter of Minos, who had fallen for him and was a dental hygienist by trade, he laid down a trail that he could follow out later. So, kids, believe it or not, Theseus confronted the Minotaur and killed him and escaped from the labyrinth by following the trail of floss. That’s not where the story ends, but you’ll have to look the rest up.